Danica has represented HD-13 since 2017. 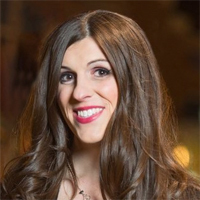 Danica Roem is a step-mom, journalist and lifelong Manassas resident. After earning a Bachelor of Arts degree in Journalism/Mass Communication from St. Bonaventure University (New York) in 2006, she authored more than 2,500 news stories about the greater Prince William County area as the lead reporter of the Gainesville Times from 2006-2015, where her reporting won seven Virginia Press Association awards. She served as the news editor of the Montgomery County Sentinel from 2015-2016, leaving her post three days before launching her campaign. She twice placed runner-up for the MDDC's James S. Keat Freedom of Information Award and won first place for local government and state government reporting in 2016. Danica also covered federal and state politics for The Hotline (National Journal Group) from 2009-2013 and worked as a content writer for Yoga Alliance from 2013-2014. November 2017 Danica became the first out transgender person ever seated in an American state legislature. Kelly McGinn is an anti-abortion Republican running for delegate in HD-13. 2017: Roem received 54% of the vote. 2016: Clinton received 54% of the vote.